There really aren’t a whole lot of good things to say about social media these days, at least in my opinion. People are so addicted to social media that they will do anything for the perfect selfie. They are constantly distracted by Facebook, Twitter, Instagram, and Snapchat that they can’t even drive a few minutes down the street without resisting the temptation to check their phones. People have lost the art of authentic, face-to-face conversation. Sometimes it feels like people are just waiting behind their computer screens for the opportunity to tear someone else down with just a few strokes on the keyboard. Outrageous stories and “fake news” are shared all over the globe, causing mass hysteria online, yet our in-person interactions still remain silent. People become so envious of one another just because one person appears to have such a “perfect life” on social media. Life-long friendships end over political battles and choosing sides and “If you’re not on my side, we can’t be friends.” It’s exhausting and depressing. However, social media does have the power to be used for good. I have been a witness to that goodness – and I’m sharing that story with you all today. My husband and I recently became the proud “paw-ents” of a 5 year old Great Pyrenees named Lady. We adopted her from a wonderful organization called Florida All Retriever Rescue. I have always loved animals, and I’ve wanted us to have a pet of our own for a long time, and once we got a fenced-in backyard it was finally possible. She has already brought many more cuddles and laughs into our lives. 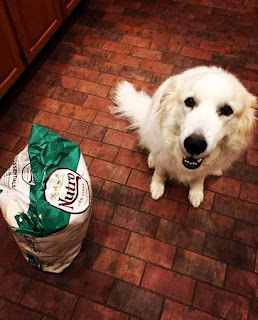 Great Pyrenees are a very unique breed of dog, and are not super common in Florida, so I started following a couple of Great Pyrenees clubs and social media pages so that I could learn more about the breed and how I could properly care for Lady. One of the organizations that I follow is called Florida Great Pyrenees Rescue & Club. Even though I didn’t rescue Lady from that organization, they still provide good information about the breed and opportunities for local “Pyr Paw-ents” to connect with one another. Recently, a news story broke that rescue organizations across the state were coming together to help alleviate a desperate rescue situation in North Florida. An animal hoarding situation had gotten way out of control. Animal hoarding refers to a person who hoards animals instead of items. At this home, rescuers had found 70 Great Pyrenees dogs. Florida Great Pyrenees Rescue & Club reached out to their followers, sharing some photos of the horrible condition the dogs were in, and asking for donations of dog food and dog shampoo as rescuers work to try and clean up the dogs that are friendly enough to be handled. Now, because we’re “those people,” Lady, our dog, has an Instagram account (@ladythegreatpyrenees). I posted a cute photo of her on her Instagram page, asking for her followers – mostly other dogs with Instagram accounts – to donate. Almost immediately, I received countless comments and direct messages from fellow Great Pyrenees owners around the country asking for more details on how they can help. Some commented that they had been following the story as well. For others, this was their first time hearing this news because it wasn’t yet a national story. Because of one Instagram post and a community of dog lovers that stick together, donations from Northern California, Washington State, Illinois, Colorado and many other states are being shipped as we speak to the rescue site, providing much needed relief. Other Insta Famous dogs began sharing the information as well, inspiring their followers to donate as well. While we can’t be there physically to wash dogs and fill their bellies with a nice meal, it brings tears to my eyes to see the impact that we have been able to make in just 24 hours. This social media platform allowed a community of people to be brought together to work towards a common cause in a way that would have otherwise been impossible. It's easy to point to social media as the root of all the world’s problems these days. At the end of the day, it really depends on how we choose to use the technological power that has been given to us. When used properly, social media can be used in a profoundly good way – to connect one another for a common purpose and make miracles happen. I have some renewed faith in the world, and I hope this story helps to life you up too. For more information on the rescue effort in North Florida, please visit www.floridapyrs.org. If you’d like to donate food or dog shampoo, contactjwilson@floridapyrs.org.